Using the 10× objective, the nuclei of the tumor cells are small (< 10 µm), hyperchromatic, and round (resembling mature lymphocytes), with no visible nucleoli and little detail in the chromatin, as shown in the image below. Renal cell carcinoma, clear cell type, Fuhrman grade 1/4. Using the 10× objective, the nuclei of the tumor cells are slightly larger (15 µm) with finely granular "open" chromatin but small, inconspicuous nucleoli (see the following image). The nucleoli are often present, and many appear as small chromocenters at 10× objective, with confirmation of their nature at higher power, but this does not count. Renal cell carcinoma, clear cell type, Fuhrman grade 2/4. Renal cell carcinoma, clear cell type, Fuhrman grade 3/4. The nuclei are pleomorphic with open chromatin or hyperchromatic and single or multiple macronucleoli, as depicted in the following image. Renal cell carcinoma, clear cell type, Fuhrman grade 4/4. 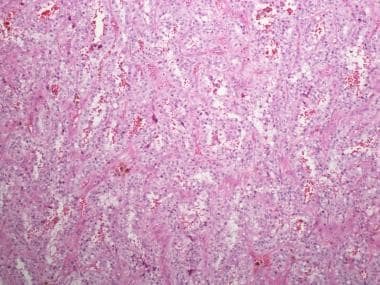 Nuclear grade has been shown to be independent of tumor type as a prognostic factor, but its value in specific histologic subtypes of renal cell carcinoma (RCC) is still in question. As the current World Health Organization (WHO) system referred,  there is no specific grading system for papillary renal cell carcinoma (RCC) and the Fuhrman system  is also accepted as applicable to it. However, Sika-Paotonu et al showed that Furman grading was unrelated to cancer-specific mortality in patients with papillary renal cell carcinoma (RCC). In recent years, studies have indicated that grading of papillary renal cell carcinoma (RCC) should not be based on nucleolar prominence alone. Similarly, Delahunt et al [18, 19] pointed out that none of the proposed grading systems for renal cell carcinoma (RCC) — including the Fuhrman grading system — provides prognostic information for chromophobe renal cell carcinoma (RCC). Nonetheless, investigations that include large series of cases are still required to demonstrate whether or not nuclear grade is an independent prognostic factor in papillary and chromophobe renal cell carcinomas (RCCs). 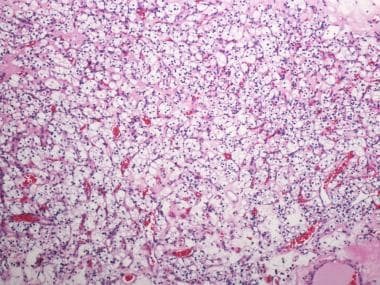 Sarcomatoid change in renal cell carcinoma (RCC) is not very rare, and it is associated with aggressive tumor growth and the development of metastasis; therefore, this change is associated with a worse prognosis. 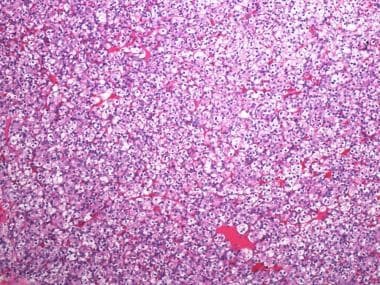 Sarcomatoid change can be seen in clear cell renal cell carcinoma (CCRCC), papillary RCC, and chromophobe RCC and should be included in the pathologic report. Cheville JC, Blute ML, Zincke H, Lohse CM, Weaver AL. 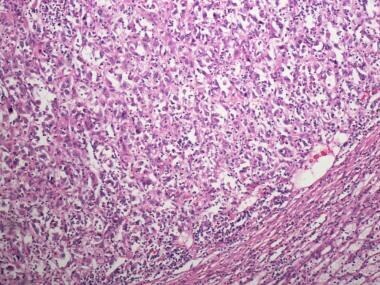 Stage pT1 conventional (clear cell) renal cell carcinmoa: pathological features associated with cancer specific survival. J Urol. 2001 Aug. 166(2):453-6. [Medline]. Ficarra V, Righetti R, Martignoni G, et al. Prognostic value of renal cell carcinoma nuclear grading: multivariate analysis of 333 cases. Urol Int. 2001. 67(2):130-4. [Medline]. Grignon DJ, Ayala AG, el-Naggar A, et al. Renal cell carcinoma. A clinicopathologic and DNA flow cytometric analysis of 103 cases. Cancer. 1989 Nov 15. 64(10):2133-40. [Medline]. Skinner DG, Colvin RB, Vermillion CD, Pfister RC, Leadbetter WF. Diagnosis and management of renal cell carcinoma. A clinical and pathologic study of 309 cases. Cancer. 1971 Nov. 28(5):1165-77. [Medline]. Srigley JR, Hutter RV, Gelb AB, et al. Current prognostic factors--renal cell carcinoma: Workgroup No. 4. Union Internationale Contre le Cancer (UICC) and the American Joint Committee on Cancer (AJCC). Cancer. 1997 Sep 1. 80(5):994-6. [Medline]. Zisman A, Pantuck AJ, Dorey F, et al. Improved prognostication of renal cell carcinoma using an integrated staging system. J Clin Oncol. 2001 Mar 15. 19(6):1649-57. [Medline]. Karakiewicz PI, Briganti A, Chun FK, et al. Multi-institutional validation of a new renal cancer-specific survival nomogram. J Clin Oncol. 2007 Apr 10. 25(11):1316-22. [Medline]. Ficarra V, Martignoni G, Maffei N, et al. Original and reviewed nuclear grading according to the Fuhrman system: a multivariate analysis of 388 patients with conventional renal cell carcinoma. Cancer. 2005 Jan 1. 103(1):68-75. [Medline]. Sun M, Lughezzani G, Jeldres C, et al. A proposal for reclassification of the Fuhrman grading system in patients with clear cell renal cell carcinoma. Eur Urol. 2009 Nov. 56(5):775-81. [Medline]. Rioux-Leclercq N, Karakiewicz PI, Trinh QD, et al. Prognostic ability of simplified nuclear grading of renal cell carcinoma. Cancer. 2007 Mar 1. 109(5):868-74. [Medline]. Smith ZL, Pietzak EJ, Meise CK, et al. Simplification of the Fuhrman grading system for renal cell carcinoma. Can J Urol. 2015 Dec. 22(6):8069-73. [Medline]. Becker A, Hickmann D, Hansen J, et al. Critical analysis of a simplified Fuhrman grading scheme for prediction of cancer specific mortality in patients with clear cell renal cell carcinoma--Impact on prognosis. Eur J Surg Oncol. 2016 Mar. 42(3):419-25. [Medline]. Eble JN, Sauter G, Epstein JI, Sesterhenn IA, eds. Pathology and Genetics of Tumours of the Urinary System and Male Genital Organs. World Health Organization Classification of Tumours. Lyon, France: IARC Press; 2004. Sika-Paotonu D, Bethwaite PB, McCredie MR, William Jordan T, Delahunt B. Nucleolar grade but not Fuhrman grade is applicable to papillary renal cell carcinoma. Am J Surg Pathol. 2006 Sep. 30(9):1091-6. [Medline]. Delahunt B. Advances and controversies in grading and staging of renal cell carcinoma. Mod Pathol. 2009 Jun. 22 suppl 2:S24-36. [Medline]. Delahunt B, Sika-Paotonu D, Bethwaite PB, et al. Fuhrman grading is not appropriate for chromophobe renal cell carcinoma. Am J Surg Pathol. 2007 Jun. 31(6):957-60. [Medline].